America is in the middle of a fashion revolution. Casual Friday is giving way to casual every day. Here at TDS, we’ve adopted a casual dress code that allows for formerly forbidden items like jeans, capris, sandals & tennis shoes. One of the driving forces behind this change is the entry of Gen Y into the workforce. These young whippersnappers state time and again that what they want in the workplace is flexibility. They want to work from home. They want to leave for a 2 pm yoga class. They want to dress casually. Oh heck, they probably even want a pony. The TDS CEO actually just responded to this with a pitch of his own. While TDS can give your employees the technical tools to enable workplace flexibility, it’s up to you to update the dress code. You can’t always get what you want on the job, but more and more employers are finding it easy to give a little of what these young workers need, especially when it comes to the dress code. We’ve already come a long way, baby. We’ve progressed from the era of three-piece suits and mandatory pantyhose to casual Fridays and Hawaiian Shirt Day. But before we take it any further we need to address a serious issue: leggings. While many a college girl lives in her leggings, Uggs & t-shirts, leggings are not pants. Repeat: leggings are not pants. Now, this doesn’t mean that leggings should be automatically banned from the office. Rather, it means that leggings need to be styled appropriately. 1. Leggings should only be worn with dresses or long tops that hit at approximately mid-thigh or lower. 2. If your leggings have feet, then your leggings are actually tights. Why are you trying to get away with wearing tights as pants? To be fair, these days it’s sometimes hard to tell if you’re actually wearing pants. I use this handy guide to pantslessness before I head out the door. In today’s office space, it’s not about banning certain articles of clothing or stifling your employees’ individuality, it’s about appropriateness. Using a site like Polyvore, you can even mock up some work-friendly looks for yourself, your employees or even younger friends & relatives. What’s obvious to one person or one generation may not be obvious to another, so providing some visual guidance now can help you avoid an embarrassing wardrobe malfunction later. 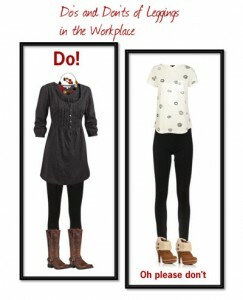 What does your company’s dress code look like and how are you dealing with the demand for a more casual workplace?